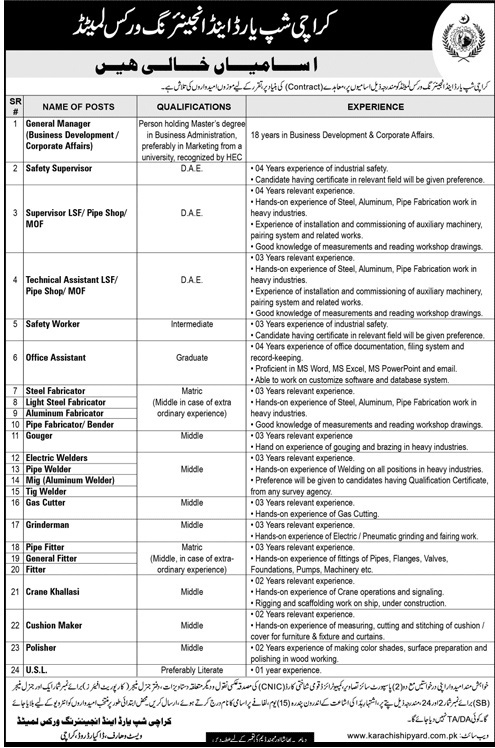 Karachi Shipyard & Engineering Works Limited Karachi Sindh. 1. Interested Candidates send their applications along with attested photocopies of education/experience certificates, CNIC, and 2x fresh passport size photographs to The General Manager (Corporate Affairs) within 15 Days of Publication of this advertisement. 2. Only Shortlisted candidates will be called for interview. 3. No TA/DA will be paid to candidates for appearing in the interview. West Wharf Dockyard Road, Karachi.